Soundtracks, solar panels and speakers mounted to trees, commission for Wave Hill's Generated@WaveHill summer series, Wave Hill, the Bronx. Wave Hill, a 28-acre park/garden in the Bronx, commissions a public piece each year for the grounds as part of their program called "Generated@WaveHill." In summer 2006, I made a sound piece that was installed in six of the trees on the grounds. It stemmed from my interest in birdsong, which has to be one of the most elusive sounds to describe. Trying to do so stretches both our linguistic and visual descriptive systems, and poses a very unique translation problem. 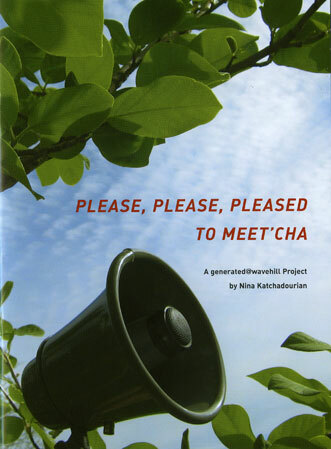 Please, Please, Pleased to Meet'cha consists of sound systems, installed into six trees on the Wave Hill grounds, with human voices vocalizing birdsong. In choosing the human voices, two things became important. I wanted to work with people who knew nothing about birds. I also wanted them to have a deep engagement with translation, so I put out a "Call for Participants" to the translators and interpreters at the United Nations. None of the "voices" I worked with had previously heard the particular birds they were vocalizing. Their performances were interpretive, generative acts: spot translations that were performed without previous familiarity with the materials. 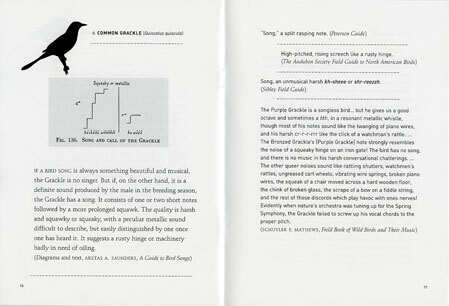 A birding guide, available at each tree, reproduced the materials that the voices had worked from so that a listener could compare interpretations.